Polsedit is a freeware utility that allows you to modify user policies such as user account rights and user privileges on a local or remote Windows NT-based system. This can be useful when for some reason you are unable ro run secpol.msc snap-in, for example, XP Home and Vista Home do not have secpol.msc at all. 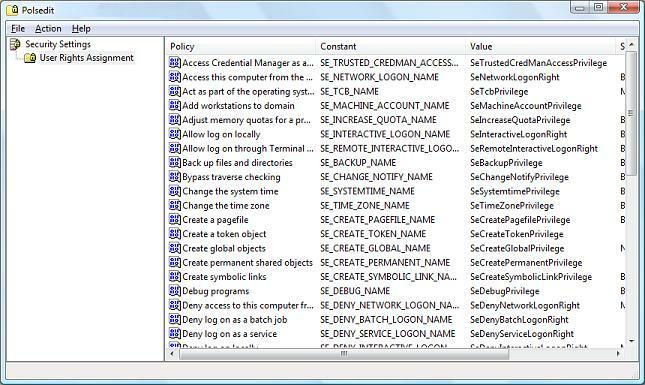 The user interface of Polsedit is very similar to the standard policies editor from Windows, but it also displays some internal data, which can be useful for developers. Features: Allows to modify user account rights and user privileges. Allows to modify user policies on a local or remote system. For XP Home and Vista Home provides ability to modify user policies which is not available by default. For Windows NT/2000 provides XP-like interface to modify user policies. Displays internal data useful for developers.